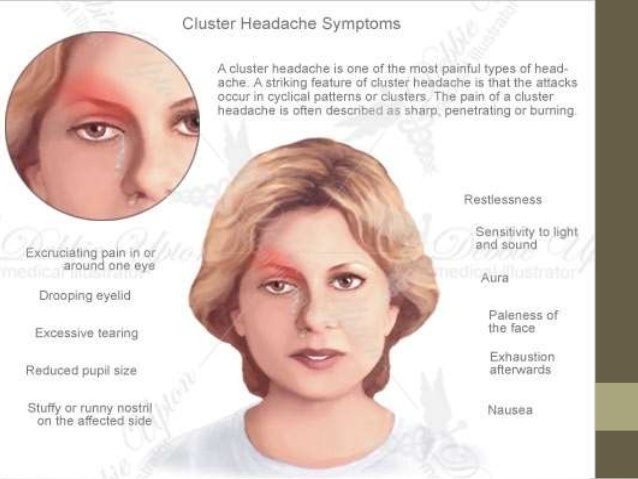 Cluster headaches are a type of a headache that recurs over a period time. Individuals who suffer from cluster headaches can experience one to three episodes per day. These headaches typically occur during a period, known as a cluster period. Cluster headaches can last from two weeks to three must. People who have cluster headaches can get them at the same time of year, such as spring and fall. 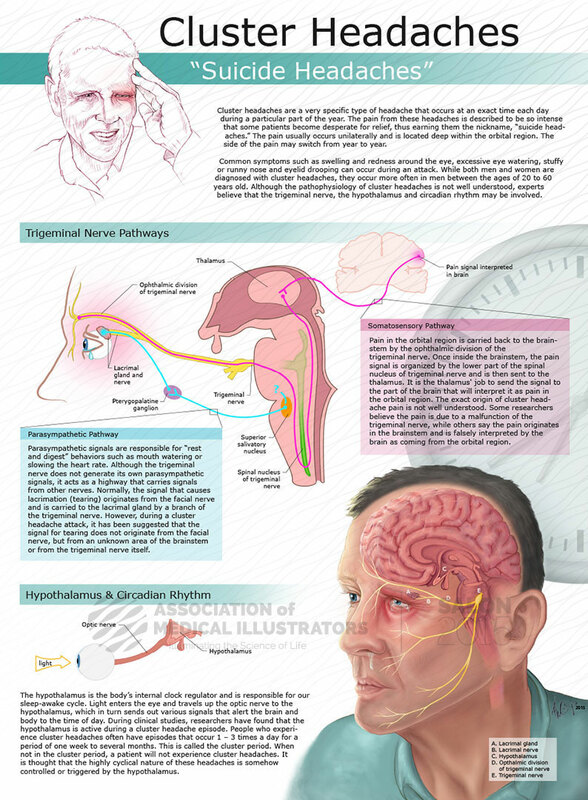 A cluster headache awakens someone who is sleeping from one to two hours after the go to bed. The nocturnal acts tend to be more severe than the daytime attacks. These attack can appear to be linked to the person’s circadian rhythm( or biological clock). 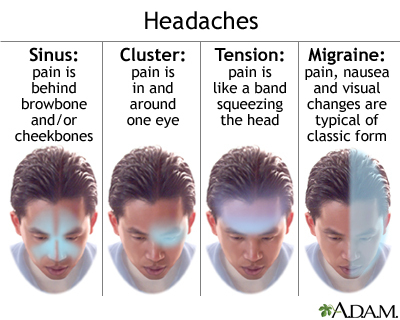 Cluster headaches can be more invested than migraines headaches but fortunate they will not last as long as a migraine. Cluster headaches can disappear entirely or go into remission for several months, or years, and recur without warning. Cluster headaches are the least common type of headaches that affect less than one in 1,000 people. Cluster headaches typically start in people before that are the age of 30. These types of headaches are more frequent in men than women. What is the Cause of Cluster Headaches? The cause of cluster headaches Isis was unknown. The headaches occur when a never pathway is the base of the brain, the trigeminal-trigeminal reflex pathway is active. The main nerve of the face that is responsible for sensations such as pain, or heat is called the trigeminal nerve. When the trigeminal-autonomic nerve is activated, it can cause eye pain, which is associated with cluster headaches. The trigeminal nerve also serves to stimulate other groups of nerves that cause eye redness, tearing, nasal discharge and congestion. The hypothalamus, within the deep part of the brain, appears to activate the trigeminal nerve. The hypothalamus is the home of the internal circadian rhythm, which regulates the sleep and wake cycles on a 24-hour schedule. Recent studies of imaging have shown that the hypothalamus is activated or stimulated during a cluster attack. Cluster headaches are not caused by tumors or an aneurysm. What had Triggers Cluster Headaches? The seasons are the most common trigger for cluster headaches. They often occur in the spring or autumn(fall). Due to the seasonal nature of cluster headaches, people often mistakenly associated them with allergies or stress. 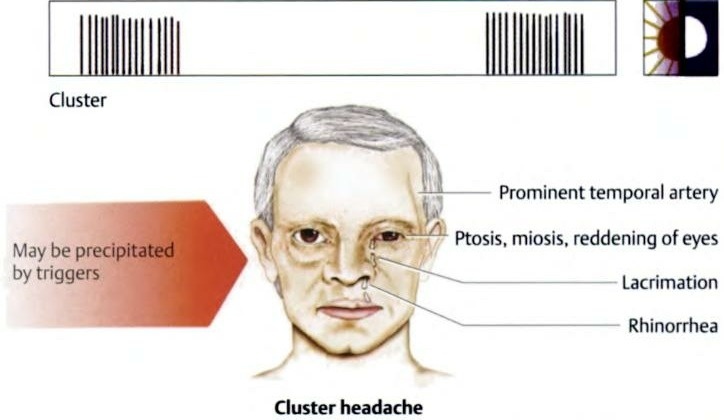 The seasonal nature of cluster headaches is likely a result of the stimulation or activation of the hypothalamus. Cluster headaches are also more frequent in people who drink alcohol and smoke excessively. During a cluster attack, the sufferer is more sensitive to alcohol and nicotine, and minimal amounts of these chemicals can trigger headaches. During a headache -free peirods, people can consume alcohol without provoking cluster headaches. Cluster headaches reach their full effect within five to ten minutes after onset. These attacks are usually very similar; they vary slightly from one attack to the next. The Type of Pain: the pain of a cluster headache is usually one-sided, during the period of a headache. The pain remains on the same sid.e When an a new headache period starts, the pain will typically occur on the same sid, rarely affecting the opposite side. Severity and intensity of the pain: The pain of a cluster headache is normally very severe and intense is often described as having a piercing or burning quality. It may constantly throb. The pain is so intense that most cluster headache suffers can not sit still; the will often pace during the attack. Location of the pain: The pain is located behind one eye or within the eye region without effect or changing to opposite sides. It may radiate to the forehead, temple, nose, cheek, upper gum on the side affected. The scope may also be tender and arteries pulsing can be felt. The Duration fo the pain: The pain of a cluster headache lasts for a short period typically 30 to 90 minutes. It may last from 15 minutes to three hours in some cases. A headache may disappear and reduce later in the day. Typically between attacks people are headache-free. The frequency of headaches: Most sufferers get one to three headaches per day, during a cluster period, ( During this time a person experience daily attacks). They occur very regularly during the same time each day and have been referred to as “alarm clock headaches” because they awaken the person the same time during the night. Most people who suffer (80%-90%) from cluster headaches have episodic cluster headaches that occur in periods lasting fourteen days to on a year, separated by pain-free episodes lasting 13 days or more. In 20% or people who have cluster headaches, the attacks may be chronic, meaning that they have less than 14 headache-free days per year. Cluster headaches are not associated with nausea or vomiting, however, it is possible for someone with migraines to suffer from cluster headaches as well. Can the Cluster Headaches be Predicted? The eye on the side of a headache may become swollen or droop. The pupil in the day may get smaller, or the conjunctiva ( pink tissue in the lines within the eyelid) may become red. Nasal discharge, or congestion, tearing of the eye during the attack, which is normally the same side of the pain. Abortive Medications. The most successful treatments are Imitrex ( sumatriptan) or other types of triptans, and breathing oxygen through a face mask for twenty minutes, There are other options such as intranasal lidocaine, and ergotamine drugs. Preventive medications – You may be prescribed preventative medications to short the length of a cluster headache and decrease the severity of the pain. All cluster headache sufferers should take preventive medications unless the cluster period lasts them less than two weeks. Some drugs that are used to prevent headaches are lithium, Divalproex sodium, prednisone for short course, verapamil and ergotamine tartrate. Surgery may be an option for people with chronic cluster headaches who have not been helped by standard treatments, most of the procedures involve blocking the trigeminal nerve. All of these treatment options should be used under the direction fo a doctor who has familiarity treating cluster headaches. With medication, it is crucial to follow label instructions carefully along with your doctor’s advice.